CNA Finance recently launched a petition that was created to support MannKind investors that have lost money as a result of the alleged malicious acts of Sanofi. If you are one of these investors, click here to sign the petition. Today, we’ll talk about why Sanofi is in the wrong, what the petition at CNA Finance calls for, and what we can expect to see from MNKD moving forward. MannKind created a product that was expected to revolutionize the way we see diabetes. The product is known as Afrezza. Afrezza is an inhaled insulin that does not require injections or pain. As a result, there is an inherent need for the product. After all, a massive amount of consumers, with and without diabetes, have a fear of needles. Not to mention, there are several people that work in areas that do not provide access to public restrooms, making it difficult for many diabetics to administer insulin injections on the job. So naturally, this product should have been relatively easy to market. Upon approval for marketing, MNKD contracted with Sanofi. The goal was for Sanofi to commercialize the treatment, ultimately leading to strong sales volume. However, that’s not exactly what happened. Over the course of the launch of the treatment, Sanofi delayed the commercialization. While there were acceptable excuses for poor sales volume in the pre-market phase, there is no excuse for poor sales volume in the Direct to Consumer phase. Nonetheless, during all phases of marketing, Sanofi kept what they were doing relatively under wraps. The only thing that seemed to be clear was the fact that Sanofi simply wasn’t doing enough. In fact, even during the Direct to Consumer phase, MNKD experienced incredibly low sales volume as not even a single television ad was launched. In the end, Sanofi simply didn’t do enough to commercialize the treatment. While that in itself isn’t enough to take the company to court, the reason for the delays and resulting losses are. Sanofi has a history of delaying the commercialization of treatments for personal benefit. In fact, the company was served court documents on November 9th of last year for doing just that. With that said, the overwhelming opinion is that Sanofi willfully and maliciously held back on the commercialization process of Afrezza, for their own personal gains. You see, Sanofi has several insulin products that would not benefit if an insulin inhaler was successful. As a result, the belief is that the company delayed marketing to ensure that Afrezza simply could not become the popular option. Moving forward, I have high hopes for MannKind. The bottom line is that the company has created an incredible product. While the commercialization of that product has been delayed, it doesn’t take away from the fact, that it is something that will eventually lead to profits. In the short run, I’m expecting to see more volatility as the result of Sanofi’s delays. Nonetheless, in the long run, we will see strong sales and this will lead to gains for the stock. Do you think Sanofi is in the wrong? Let us know your opinion in the comments below! 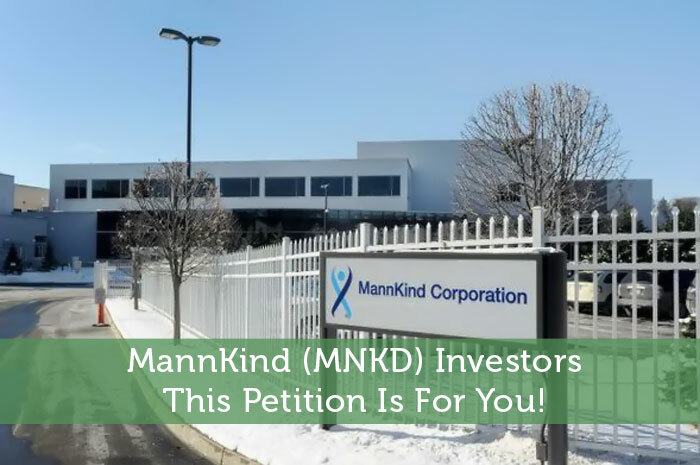 MannKind (MNKD) Investors: This Petition Is For You! This reminds me of what LGE did to Zenith Electronics, and killed a potential new American industry for HD TV’s. While what they did is not illegal, it certainly smacks of questionable ethics. Playing hardball for market share will probably continue as growth slows down worldwide. Maybe Al Mann should have known better, given Sanofi’s MO.